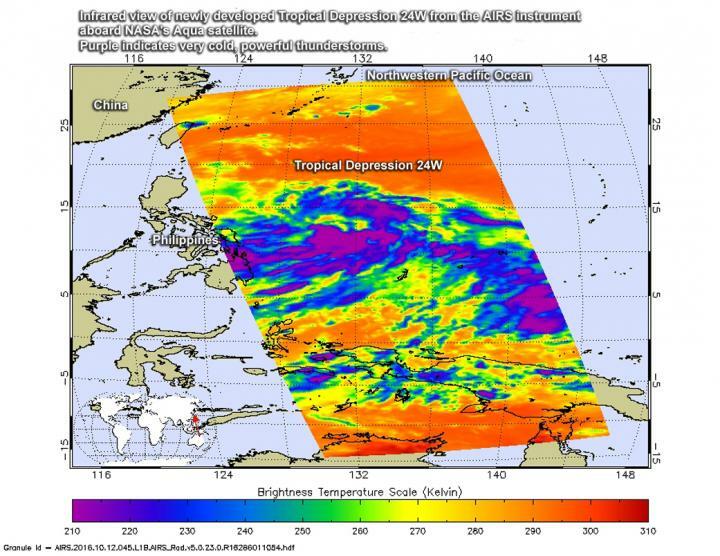 The Atmospheric Infrared Sounder or AIRS instrument that flies aboard NASA's Aqua satellite analyzed Tropical Depression 24W (TD24W) in infrared light at Oct.12 at 12:29 a.m. EDT (429 UTC). Coldest cloud top temperatures exceeded minus 63 degrees Fahrenheit (minus 53 degrees Celsius) in bands of thunderstorms east of the center from the northeastern to the southern quadrants. Storms with temperatures that cold are high in the troposphere and NASA research has shown they have the ability to generate heavy rain. The Joint Typhoon Warning Center (JWTC) bulletin on Oct. 12 at 11 a.m. EDT (1500 UTC) noted that TD24W has maximum sustained winds near 30 knots (34.5 mph/55.5 kph). It was located near 13.2 degrees north latitude and 129.8 degrees east longitude, about 526 nautical miles east of Manila, Philippines. TD24W was moving to the west-northwest at 11 knots (12.6 mph/20.3 kph). JTWC forecasts 24W to strengthen into a typhoon and make landfall in Luzon, northern Philippines sometime on Oct. 15.